A global crisis such as Ebola requires fast, targeted action, and, as USAID’s Administrator Rajiv Shah said last week, “the success of the Ebola response is access to real-time data”. GeoPoll’s own CEO, James Eberhard, recently penned an Op-Ed which similarly argues that better data is crucial to tracking and stopping the spread of Ebola. At GeoPoll, we’re working with partners worldwide to monitor the spread of the disease and understand the long-term effects of Ebola. Our ongoing work with the World Food Programme has already provided valuable data on food security in Sierra Leone, and the WFP has also just released findings from our surveys in Liberia, and Guinea. All 3 countries are currently affected by food insecurity, and the regions where Ebola is most prevalent have even more fragile food security than surrounding areas. 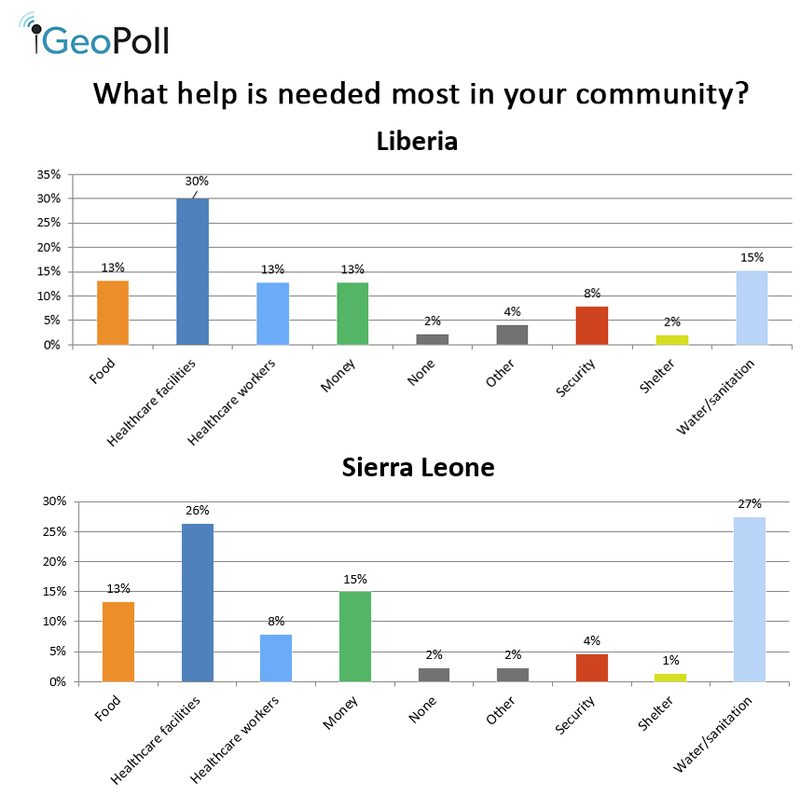 Last week we asked GeoPoll users in Sierra Leone and Liberia about the most pressing needs in their communities, and their perceptions of the international response to the Ebola crisis. We collected mobile survey responses from over 1,000 individuals in each country (n=1,001 in Sierra Leone and n=4,025 in Liberia) from November 5th-12th. Interestingly, responses were very similar across the two countries. Respondents from both countries are satisfied with the international community’s response, with 45% in Sierra Leone and 54% in Liberia reporting they are “very satisfied” with the response. 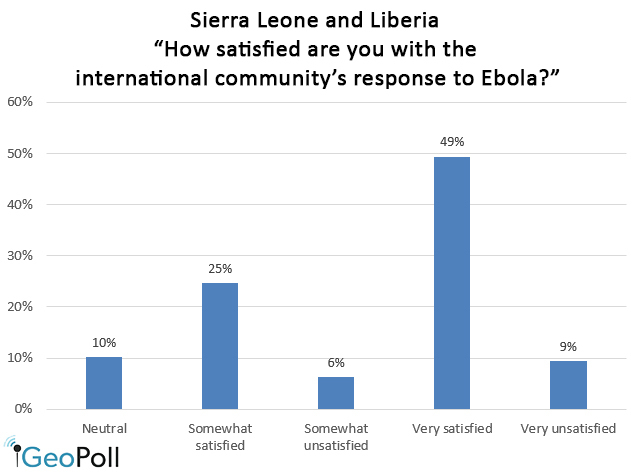 In Montserrado county, which includes Monrovia, one of Liberia’s Ebola epicenters, 55% of respondents were “very satisfied”, and 78% of respondents were either “somewhat” or “very” satisfied with the international community’s response (n=1,261). In total, only 17% in Sierra Leone and 13% in Liberia reported they were either “somewhat” or “very” unsatisfied with the response. We also asked respondents “What help is most needed in your community?” with food, healthcare facilities, healthcare workers, money, security, shelter, and water/sanitation as answer options. In Liberia, healthcare facilities was by far the most common answer, with 30% of respondents choosing it. 15% of Liberians said water and sanitation help was needed most, 15% said money, and 13% said healthcare workers. In Montserrado county responses were similar: 29% healthcare facilities, 16% water/sanitation, 12% healthcare workers, 12% money, and 14% food. As we have seen with food security, the effects of Ebola are wide-ranging, which could be why responses are quite spread out, and water/sanitation and food help are requested just as much as healthcare workers. In Sierra Leone, respondents had similar needs, although more respondents listed water/sanitation as their biggest concern. 27% of respondents listed water/sanitation as their greatest need, and 26% stated healthcare facilities are needed most in their community. In both Sierra Leone and Liberia, the perceived need of healthcare workers was quite low: 8% and 13% respectively. This survey only included these two simple questions, but over the next months GeoPoll will work with partners to collect valuable information on knowledge of Ebola spread, symptoms, and more. As a note, GeoPoll always takes very seriously the privacy of respondents, and we have put extra precautions in place when asking about sensitive health issues such as Ebola. All responses are completely anonymous, and when asking questions about the disease we are including a message informing the participants that we are asking about Ebola, and that their responses are confidential. We are also including the phone number for the national Ebola hotline for users to call with health concerns, displayed at both the beginning and end of surveys. For more data from GeoPoll’s surveys, sign up for our blog alerts at the top of this page, and click below to contact us about running your own survey with GeoPoll.